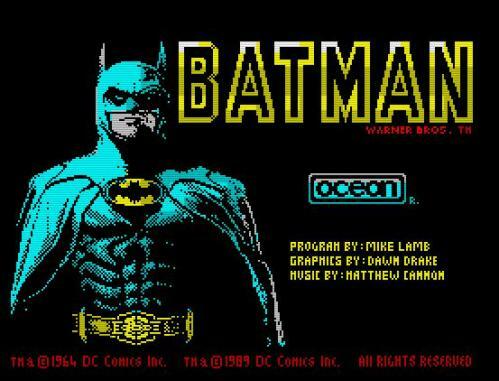 Ocean software were, for a very long time, considered quite rightly to be one of the best (if not THE best) software houses for converting a movie licence to a more than reasonable game. Sure, they missed the mark every now and again, but usually they delivered the goods with alarming regularity. 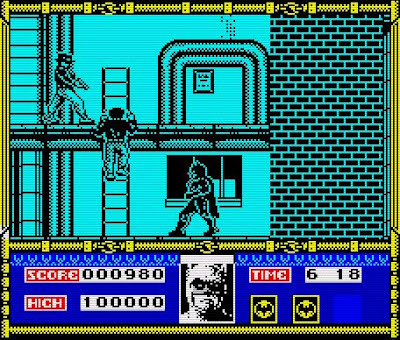 And the good thing was they stuck to a simple formula, where they would take certain key scenes from the film and base a level on each one, creating a multi-level multi-style extravaganza (unfortunately occasionally leaving out 48K owners). During one of their most awesome phases, Ocean produced licensed wonders such as Robocop, The Untouchables, and the subject of this review, Batman: The Movie. Distancing itself from the original Batman isometric 3D adventure and the “Batman: The Caped Crusader” game, this game was divided very simply into 5 levels, with you donning the cape and assuming the eponymous hero’s role. Levels 1 & 5 are superb platform levels, the first in the form of the Axis Chemical Plant, where you had to basically defeat many of Napier’s thugs (armed with guns or grenades) by means of Batarangs and your Bat Belt, avoiding natural(ish) hazards such as long falls and chemical drips. The level is pretty big, and to get to the end you’ll need to get the hang of using your Bat Belt (and Bat Rope) to swing and hoist yourself up to platforms above. 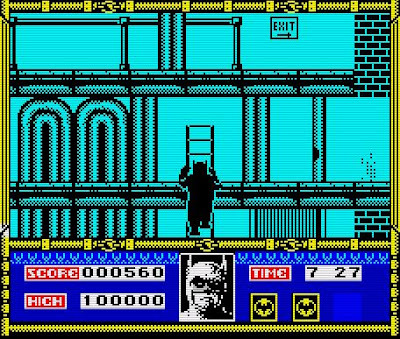 Once at the end of the level, you must knock Napier from his platform into a VAT of chemicals (much like the film), turning him into The Joker. The player and enemy sprites are large and detailed, and, remembering you lose a third of the screen with the score panel and energy meter, it did make things a bit “Close Quarters”, as in you didn’t necessarily see an enemy until they were upon you. However, minor gripes aside, the first level was a nicely balanced affair, with enough challenge for first-time players to come unstuck, but not overly difficult. 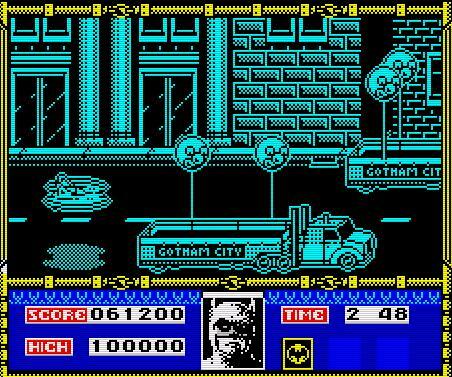 Level 2, then, and it’s into the Batmobile and one of the more challenging and frustrating parts of the game. Viewed from the side you must drive through the streets of Gotham city, avoiding other cars on the road and blockades, occasionally turning left (and left only) to get to the Bat Cave. Getting to the end within the time limit is no problem, but without careful maneuvering your energy level wouldn’t last the distance. 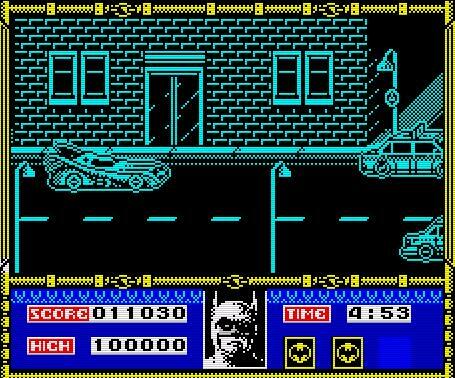 You had two choices at turning left, either fire the bat rope to the lamppost on the corner and swing round (the fastest and most stylish way), or skid sideways and attempt to drive through that way. Whilst I preferred to skid, it was definitely cooler to use the bat rope. Reach the Bat Cave, and it’s onto the puzzle mini-level. Several products are in front of you, 3 of which are contaminated by the Joker’s evil poison thing. You select 3 products and are told how many of those are contaminated. From this you must use logic to determine which three are the correct answers. It’s a simple enough problem, made more difficult by the (very tight) 1 minute time limit. Of course, you could be lucky and pick all 3 right answers first time. Onto level 4, then, and probably the most difficult part of the game. The Joker has decided to release his poison in the form of Gas, and to do so has staged a parade with lots of balloons, all filled with the poisonous gases. Taking control of the Bat-Wing (Seriously, was EVERYTHING in Bat Man some form of “Bat”-thing? Need a shower? Use the Bat-Gel. Bad case of diarrhoea? You’ll need Bat-Roll and Bat-Suppositories. Anyone for Cricket? I’ve brought the Bat-bat), your job is to fly through the parade, cutting the connecting cables of the balloons, releasing them into the air and away from the city. No doubt you’re saying “That doesn’t sound so hard!”. Wait until the helicopters come along, matey. One touch equals death, so you’d better be good at manoeuvring past them, or you’ll soon end up as Bat-Soup. To finish, then, it’s a final chase of the Joker up to the roof of Gotham City Cathedral. This time, you’ve got spiked floors to contend with (instant death!) and also crumbling floors, so you’ll need to be on your guard all the way through. Taking the Joker out at the end is slightly different, but I’ll not spoil that for you. If you got that far, you deserve to discover it for yourself. OK, so that was a bit of a short, to-the-point answer, but this is a short, to-the-point game. Even with the time limit of 10 minutes on the platform levels, you’ll easily do that once you know where you’re going. But even so, it’s a highly polished product with some superb graphics, and lots of nice touches, so it’s certainly worth hunting down and playing through. 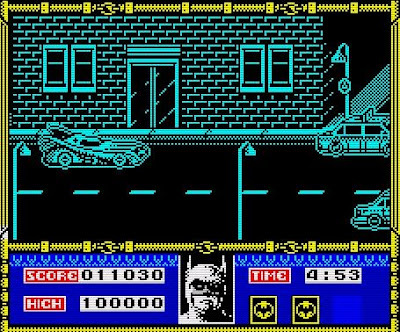 Among my favourite of the touches is the energy bar, something that was used in The Untouchables, too, where the energy bar is in fact the picture of Batman at the bottom of the screen. As you lost energy, Batman’s face was replaced by The Joker (In the Untouchables, they used Al Capone, obviously). This was probably why Ocean’s games often had a big status bar, to fit in the score, number of lives, time limit AND A GREAT BIG BENKING ENERGY BAR PICTURE! Whilst it is a nice touch, sometimes you did wish the play area was a little bit bigger. Finally, it’s also worth mentioning the music. 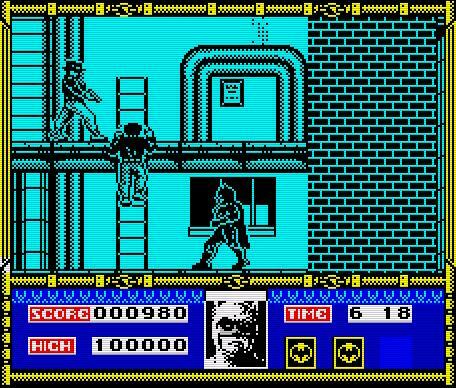 Whilst I don’t know if it’s based on music from the movie (I’ve not really watched it that closely to be fair), the 128K soundtrack is most enjoyable, and suits each level REALLY well. In fact, it’s so good, I have the Batmobile level music on in the car sometimes. So yeah, I’d advise you to check out this little gem of a game, you may well finish it in one sitting, but you’ll have fun doing it, and maybe you’ll want to check out Ocean’s similar movie tie-in licences such as Robocop and The Untouchables.